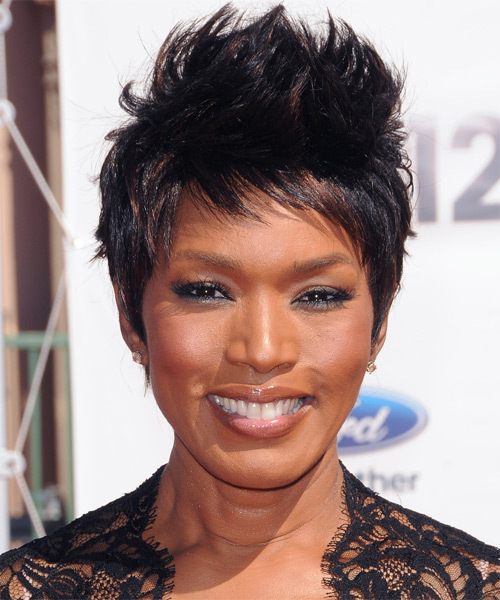 We take a look at a great short hairdo from Angela Bassett, which is super cool. This hairstyle suits her oval face perfectly and brings the focus to those fabulous eyes of hers. Although this style is usually seen on younger celebs in Hollywood, Angela Bassett proves that women can look fierce at any age with this haircut. This style will suit all face shapes except for square, and looks particularly great on oval and round face shapes. If you want to copy Angela's look, ask your hairstylist to give you a short haircut that is tapered on the sides and back. The fringe should frame the face and have lots of texturing and slicing to give it that wispy look. Your stylist should leave the top layers long, again with lots of texturizing and making it easy to style up to give it a windblown look. This is great hairstyle to balance out a round face and will need regular trims to maintain the style. To style this 'do, invest in a great root boosting product and extra-strength hairspray. A little wax on the ends will separate the pieces nicely and keep them in place. Backcomb the roots on the crown of the head to make the top layers stand up and voila! You now have the Angela Bassett spikey hairstyle. Don't forget to use loads of hairspray to keep this vertical style in placeâ€”especially if it's a windy day!